[Northern Colorado Beer News] - Welcome to your weekend! It's finally Friday and this weekend is a special one for Dad's too as we celebrate Father's Day this Sunday. Be sure to treat your Dad to his favorite craft beer today from your local brewery. There's a lot of freebies for Dad this weekend - just read on! Beat the heat at a taproom near you with tips on deals and fun events. There's even a new brewery opening today in Fort Collins! Here's what's happening around the Northern Colorado craft beer scene today, Friday, June 17th, 2016. If you aren't reading this article on FermentedlyChallenged.com, you don't know what you're missing. 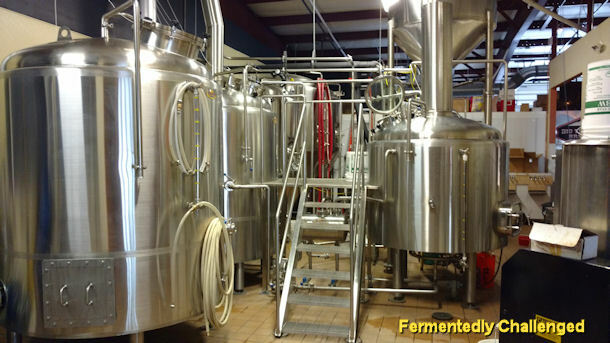 Also be sure to follow Fermentedly Challenged on Facebook too. Picture of the Day comes from: Big Thompson Brewery in Loveland, CO.
Boulder Beer Company announces their new June beer release: Pulp Fusion, an IPA made with Blood Oranges for a vibrant citrus flavor. It's on tap and also available in 6-pack 12oz bottles. Live music in the taproom every Thursday and Saturday from 5-9pm on the patio. They also host daily brewery tours at 2pm - FREE tour! Additional tour available on Saturdays at 4pm. Closed Sundays. Tuesdays are Infusion Tuesdays where they select something different to infuse their beers with. Located at: 2880 Wilderness Place, Boulder, CO. Crystal Springs Brewing Company is now serving lunch in their taproom on Fridays! They offer pizza by the slice, pretzel dogs, chili and more - plus their great line-up of craft beers. Open Fridays at 12 noon. Located at: 657 S Taylor Avenue, Unit E, Louisville, CO. Fate Brewing Company wants you to use your smart phone and capture some pics of you and your Fate canned beers enjoying a summer adventure. Post 'em to social media using hashtag #drinkyourFATE and you could win a complimentary Fate pint on the house. Also, bring Dad to Fate on Sunday because he'll get a FREE core pint! Located at: 1600 38th Street, #100, Boulder, CO. Gravity Brewing is participating in today's Downtown Louisville CO Street Faire starting at 5pm. They'll be pouring their Golden Mosaic Pale Ale and Orange Blossom Saison. Stop by to see them at the Faire or at their tasting room. Live music tonight from MarchFourth starting at 6:15pm at the Faire. Tasting room located at: 1150 Pine Street, Unit B, Louisville, CO.
Left Hand Brewing Company has a deal for Dad this weekend. Bring him in on Sunday, June 19th for Father's Day and buy him a pint and he'll get to keep the 16oz Left Hand Pint Glass! Located at: 1265 Boston Avenue, Longmont, CO.
Mountain Sun's Under the Sun Eatery & Pizzeria has a deal for Father's Day. Every Dad that dines at Under the Sun will receive a FREE 8oz house Mountain Sun beer. One lucky Dad will win a raffle prize too. Located at: 627 S Broadway Street, Boulder, CO.
Oskar Blues Grill & Brew is hosting their Priscilla White Wit Wheat release party tonight. Pre-party and Hop aboard the trolley at The Tasty Weasel taproom in Longmont by 7pm and they'll take you up to Oskar Blues Grill & Brew in Lyons for the celebration. Listen to some live music in the basement there and celebrate the weekend. Located at: 303 Main Street, Lyons, CO.
West Flanders Brewing Company wants you to help Dad celebrate Father's Day. Bring in your Dad and he'll get a beer flight for half off on Sunday, June 19th. A West Flanders burger pairs well with that flight. Now on tap: Oakie Daisy, a Belgian Strong Ale aged for 4 weeks with an oak infusion spiral for a smoother taste and a hint of vanilla. Also, back by popular demand is their award-winning Mr. Chain Blue Lightnin'. Look for West Flanders to be pouring at the upcoming Rocky Mountain Pizza and Pints Festival happening June 25th from 3pm to 9pm in Louisville's Community Park. Brewery located at: 1125 Pearl Street, Boulder, CO.
Berthoud Brewing Company is offering Gift Certificates for Dad to pick out his favorite beer at BBC. He can use it for buy a new growler and fill or simply enjoy pints at his leisure. Live music tonight from bluegrass duo Brothers Picker from 6-9pm. BBQ available outside from 6-8pm too. Located at: 450 S 8th Street, Berthoud, CO.
Buckhorn Brewers LLC is once again back open after taking a 1 week vacation. Stop by their taproom tonight for some tasty beers and get your Loveland Passport stamped! Located at: 4229 W Eisenhower Blvd, Loveland, CO.
City Star Brewing is hosting Happy Hour for Dads at the taproom all day Sunday. Plus the Berger Radio Food Truck will be parked outside that day from 12pm to 7pm. Coming soon: Mango Habanero IPA (June 26th). Tonight - live music from Greg Schochet and Mike Finders from 7-9:30pm. And on Saturday listen in to Felonius Smith from 7-9:30pm. Then on Sunday, the sounds of Maya Bennett from 7-9:30pm. Located at: 321 Mountain Avenue, Berthoud, CO.
Coopersmith's Pub & Brewing is offering Gift Cards, shirts, hats, growlers and more for Dad's Day gifts. Plus there will be a Father's Day 5K fun run on Sunday - a family event hosted in Old Town Square. Located at: 5 Old Town Square, Fort Collins, CO.
Crow Hop Brewing Company will be tapping a special beer from the Loveland Homebrew Club on Saturday, June 18th. It's a classic pilsner (5.2% ABV) and is a clone of the popular Pilsner Urquell. They'll also have a Baltic Porter (8.5% ABV) as well. Located at: 217 E 3rd Street, Loveland, CO.
Equinox Brewing now has fresh batches available of their Event Horizon Imperial IPA and their Super Giant Imperial Hefeweizen. Live music also from Cary Morin from 7-9pm. Food available from Mac N' from 4 to close. Located at: 133 Remington Street, Fort Collins, CO.
Grimm Brothers Brewhouse is tapping a firkin today - it's a Grasshopper Snow Drop, a brew infused with mint and chocolate. It's a twist on the classic cocktail - betcha love it! Located at: 623 Denver Avenue, Loveland, CO. Horse & Dragon Brewing Company is now pouring their Belma Session IPA, on CO2 and on Nitro. Come try a pint tonight. Located at: 124 Racquette Drive, Fort Collins, CO.
Jessup Farm Barrel House want you to enjoy a beer tonight and rock out to the sounds of Queen Bee & the Stingers starting at 5pm tonight. Perfect night for music and a brew. Located at: 1921 Jessup Drive, Fort Collins, CO.
Maxline Brewing held a soft opening last night and is open today from 11am to 10pm to the public ahead of tomorrow's official Grand Opening party. Come have a beer out on their patio. They've got 4 beers to start off: Irish Red, ESB, IPA and Oatmeal Stout. The brewery is dog friendly too. The G.O. party starts on Saturday at 5pm with tours, live music, games & prizes, BBQ, Meet the Brewer and more. Take the MAX train, ride your bike or park in their spacious lot. Located at: 2701 S College Ave, Unit 190, Fort Collins, CO.
New Belgium Brewing now offers a hard cider? Yup and you can get a taste of it over at Scrumpy's Hard Cider Bar in downtown Fort Collins. It's called Side Trip and is a semi-dry cider. Scrumpy's is located at: 215 N College Avenue, Fort Collins, CO.
Pateros Creek Brewing Company tapped an Oreo Porter last night that you won't want to miss. Start your Fort Collins Beer Week a day early at PCBC. Located at: 242 N College Avenue, Fort Collins, CO.
Zwei Brewing will host "Bark 'N' Brew tomorrow, Saturday, June 18th from 11am to 3pm at the brewery. This fundraising event will help benefit Elder Pet Care. For $15 you'll get a hamburger, a side, some chips, a Zwei beer and the pleasure of knowing your helping our elder 4 legged friends. There's even a new craft beer release that day to try. They have 20 different beers on tap in all! Something for every taste. Located at: 4612 S Mason Street, Ste 120, Fort Collins, CO.
Zymurgy Magazine came out today with their "Best Commercial Beers in America" list and in the Top-Ranked Beer Portfolios category, two Northern Colorado breweries made the list: 4th Place - Avery Brewing Company with 42 beers, and 5th Place - New Belgium Brewing with 41 beers. Zymurgy Magazine is the official publication of the American Homebrewers Association. Grats to these two Colorado breweries for getting national recognition! Brix Taphouse & Brewery is hosting a mini tap takeover today for Great Divide Brewing Company. They've got a special going on - order a Great Divide Denver Pale Ale and a Brat - both for just $7 while supplies last. Come to downtown Greeley for Friday Fest and drop by Brix while you're there. Just 1 block north of the Go Cup district. The event starts at 7pm. Located at: 813 8th Street, Greeley, CO. Broken Plow Brewery - New beer alert! Today after 2pm Broken Plow will be tapping their new Broken Plow Vienna Lager. Its described as a lager that's malty, crisp, cold and refreshing. Enjoy one on their covered patio. Food tonight available from Elements Wood Fired Grill and acoustic Folk entertainment from Jim Kristoff starting at 7pm. Located at: 4731 W 10th St, Unit G, Greeley, CO.
Crabtree Brewing Company is offering teachers (with faculty ID) $1 off beers until midnight. Start off your weekend at Crabtree - Greeley's oldest brewery. Located at: 2961 W 29th Street, Greeley, CO.
WeldWerks Brewing Company announces that their popular Juicy Bits New England Style IPA is now back on tap today. Crowlers of this beer will be available starting Sunday. Food available tonight from Corndoggies starting at 4pm. Live music from David Nemo starting at 7pm. On Saturday, look for the release of 3 new sour beers (same 3 featured at SourFest) and their collaboration beer Robot Librarian on Sunday in conjunction with their two Medianoche Imperial Stout releases too. It's great release weekend - bring Dad! Located at: 508 8th Avenue, Greeley, CO.
Wild Cider says that this is the perfect time to drop by and enjoy a crisp refreshing hard cider. Enjoy a cool drink outside and stay for some soccer pool, corn hole, giant jenga and more. Enjoy some gorgeous sunsets and magnificent views of Longs Peak at their taproom patio. Try one of their special ciders like: Fresh Lemon Basil or a cold Agave Peach. Open Thursday, Friday & Saturday at 3pm to 8pm. Located at: 11455 County Road 17, Firestone, CO.